In it's thirteenth installment, our weekly correspondence from Tom Kristensen continues. In this week's letter, TK gives us a "play by play" description of what a lap around Le Mans consists of. To read the "King of Le Mans' " description of every turn, straight, and braking point (and much more) is truly a unique experience. It's hard to believe that we're just under two weeks away from the big race! "Today I’d like to tell you a few things about the track where the fastest 24-hour race of the world is held. Although the layout of this circuit has been repeatedly modified with new elements since 1923, the length of the track and all of its fascination has remained the same. Just once a year a race is held here and tests aren’t possible either because part of the circuit is made up of public roads that are only closed when the track is in use. The biggest change arguably resulted from the two chicanes on the Hunaudières straight. Without these chicanes the cars used to achieve speeds of over 400 km/h, which really fills me with awe. Today’s speeds are ‘merely’ close to 340 km/h – but we’re setting faster lap times now on the 13.629-kilometer track. That shows much the technology has advanced over the past few decades. Every part of the circuit has its own special character. It starts with the Dunlop chicane which we brake into from about 300 km/h and where we run over the curbs on the left and right. Through the famous Dunlop bend we run on a pretty steep downhill stretch to ‘Esses’ and from there to Tertre Rouge. This is a very nice, fluid and aggressive sector that provides a lot of grip but has some bumps as well, which makes it a little tricky. It’s also a very special passage with a corner dropping toward the outside behind a hilltop. On the inside you can drive over the curbs with unweighted wheels but you should avoid the curbs on the outside because they’re not good for the car. At the exit of Tertre Rouge it’s important to take a lot of speed into the first part of the Hunaudières straight. I usually drive on the right-hand side of the track and only switch to the left about halfway through the straight. Because of the many ruts in the road there are just a few places on the straight where you can change sides without bottoming. I only brake about 170 meters before the chicane. You arrive there flying at more than 340 km/h and hit the brakes extremely hard at first. That produces almost 3 g, which is quite a physical strain. Because of the ruts you’ve got to perfectly control your braking power when turning in because otherwise the front wheels might lock. Only after having crossed the ruts you can brake a little harder again – that’s a little unusual, but very typical for Le Mans. The second chicane is a little faster and inverse to the first one. You brake on the right-hand side and then turn the wheel toward the left. At the entrance there are not just ruts but there’s a compression, too, after which you’ve got to immediately change directions. This is a key place. At the exit of the second chicane you go straight all the way up to the curbs, but not any father, so that you won’t lose traction. At the end of Hunaudières you almost reach top speed again although you’re not quite as fast as you were in front of the first chicane, which is the quickest place on the circuit. The famous hilltop at the end of the straight was almost completely removed a few years ago. 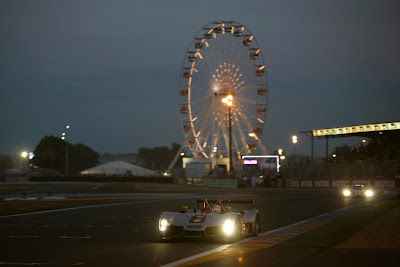 Still, Mulsanne is a place every Le Mans fan should visit some time, particularly a night. You’ve got to brake extremely hard, in a slight right-hand turn. The tarmac there is pretty bumpy, so the car becomes a little unstable when braking into this turn. You get the feeling of driving into a trap because you’re heading straight for the guard rails at 330 km/h and the distance to the gravel is very short. Consequently, you need to be fully concentrated when braking here. At Mulsanne you can use the flat curbs on either side. What follows is another straight which is much narrower than Hunaudières, though. It almost feels like driving on a freeway and you can also use the embankment on both sides. After Mulsanne the road is so narrow that there’s just enough room for two cars side by side – that is, if they give each other enough room. If a car is running in the middle you can’t overtake. Just before Indianapolis we’re just a little bit slower than we are in front of the first chicane. You wouldn’t even notice the slight bend between Mulsanne and Indianapolis in a road car. But in a race car at about 330 km/h this is a real bend. There is a famous hilltop here where you’ve got to be a bit careful in a duel with another car. In the right-hander from Indianapolis you lift a bit and let the car coast through the corner at high speed. By the way, with a diesel engine like the one we’ve got in the R15 TDI this is a typical driving style. Afterwards you’ve got to brake very hard for Indianapolis 2. I brake with my left foot here and accelerate a little with my right foot to stabilize the car. In the slightly elevated right-hand turn of Indianapolis 2 you mustn’t make any mistakes. If a wheel locks here you get thrown out of the corner and end up in the gravel trap – and in that case you will have been lucky because the guard rails aren’t far away. You then briefly accelerate before the slowest corner of the circuit starts: Arnage. This is another place where it’s easy to make a mistake. For one, you’ve got to switch gears mentally because such a slow bend follows the long, fast straight. For the other, the brakes are still pretty hot from the last corner so that they tend to fade. That’s why you can often see stopped wheels here because in such a situation you tend to hit the brake pedal even harder. And the problem is that the wall is just 50 centimeters from the curb. Exiting Arnage is no problem – at least not when it’s dry. In rain, the track wouldn’t have any grip here either. Then, an almost romantic sector through a very beautiful landscape follows before you hit the Porsche corners. And that’s a real challenge every time. You arrive here with about 330 km/h as well and bottom at the place where the asphalt of the country road changes to the permanent part of the track. This place determines ride height for the set-up, so you shouldn’t bottom too hard because you go through the corner at about 280 km/h. In the Porsche corners and in Maison Blanche, which comes next, you almost feel like you’re inside a tunnel. You drive at over 240 km/h almost the whole time, and it’s practically a blind run, which goes up and down a little as well. The last left-hand turn drops toward the outside a little. At this place the car can understeer. It’s very important to choose the right line here and to have confidence in your car. In traffic you can lose a lot of time in the Porsche corners because you’ve got to leave the line and there’s an extreme amount of rubber next to the line. That makes things very tricky lap after lap. For the Porsche corners you actually need massive downforce. But that would mean that you’re not fast enough on the straights. At Le Mans it’s crucial to find the right compromise. In front of the last chicane there’s another little right-left bend that you take flat-out but which can be quite a challenge. In front of the chicane you’ve got to brake extremely late but the braking maneuver must be finished before you run over the curbs. You’ve got to take this short-cut but mustn’t damage the car. Then you can really throw the car into the second part of the chicane. When driving at night all the lights at the start and finish are a little confusing. That’s hard on the eyes. Even when you return to the dark side of the track after the Dunlop chicane, it’s still a big strain on the eyes. So much for a lap at Le Mans. There’s one more thing I should mention and that’s the many marshals who work at Le Mans. They not only come from France but from everywhere and they do a fantastic job. They’re very professional and try to interfere with the action on the track as little as possible. All the drivers at Le Mans appreciate the work of the marshals.